If you've ever scrawled a get-well wish on a friend's broken leg cast, you've seen what plaster of Paris is and how useful it can be. But plaster of Paris has been used since ancient times for decorative purposes too. Why has plaster of Paris been used for so long, and what makes it such a popular casting material? To understand the popularity of plaster of Paris, one need only look at plaster techniques in orthopedics since it led to dramatic improvements in setting broken limbs in the mid-1800s. The earliest references of casting being used for medical purposes and injuries go as far back as 350 BC when the father of modern medicine, Hippocrates, wrote about using resin and wax for immobilizing limbs. Plaster of Paris, though, was a game changer when surgeon Antonius Mathijsen, practicing at a hospital in Haarlem, Netherlands, realized that after casting a limb in plaster and water, the cast began to harden in minutes. In 1852, he wrote about his method for casting and it became standard practice in medicine and limb setting for the next century. 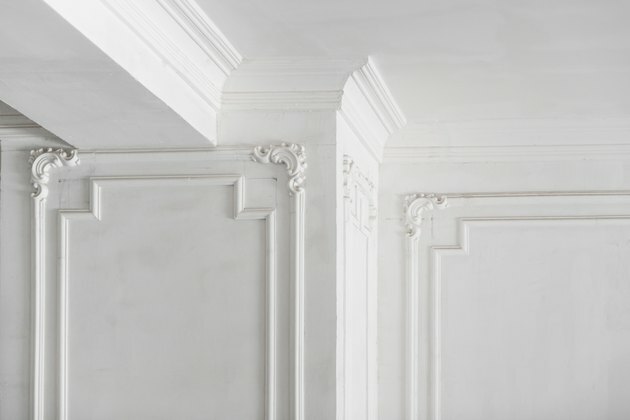 Plaster of Paris isn't the only plaster out there, but it's what we know best, thanks to it being easily made from gypsum and affordable. Plaster of Paris was used as far back as the Ancient World where it was popular in Egyptian tombs as well as Roman and Greek architecture and art. It's been used for decorative flourishes on pillars and columns and along ceilings and railings, from Antiquity through today. Elsewhere, dentists have long used it for casting patients' teeth, just like sculptors have for casting a subject's head or body. You'll spot it in old mystery movies when preserving footprints and tire treads in the ground at crime scenes. Ancient frescoes in Italy and elsewhere owe their vibrancy to the paint being applied to plaster that hadn't completely set. Anyone who has ever tried to hang art on a lath-and-plaster wall knows how vulnerable it can be. It chips easily and requires special attention and predrilling just to put up a picture. Wherever it's used, it's porous, stains easily and can be harmed by water or moisture. Plaster can be sealed to reduce porosity and sensitivity to humidity. Knowing if it has been sealed is important to how you care for it; a light sheen rather than a matte surface can suggest sealant. Whether sealed or not, the options are limited for cleaning it. Tools of the conservator trade include the white Mars Staedtler eraser that can be found at art supply or stationery shops. Another is a dry-cleaning putty called Groomstick that can remove more stubborn dust and light dirt. Dusting plaster with a clean cloth or feather duster is fine. Sealed plaster should only be cleaned with a slightly damp cloth if absolutely necessary, and even then, very carefully. For anything beyond dust, one might want to consult a conservator.